For the past 4 months I’ve been organizing and participating in a queer book club on meditation and mindfulness. Not only has it fostered a small but great community centered around kindness, gratefulness, and honest practice, but I’ve gotten to read some really great books! So far we’ve read Being Peace by Thich Nhat Hanh, The Mindfulness Sampler by Shambhala Publications, Waking Up to What You Do by Diane Rizzetto, The Tao of Pooh by Benjamin Hoff, and The Force of Kindness by Sharon Salzberg. In the beginning we were meeting twice a month, but after a while we decided to go to once a month to make it easier to finish the books. If you’d like to participate, follow the link and request to join the Facebook group! Anyway, I find that when I spend more of my week dedicated to being mindful, or being calm, or being kind, I am more persistently satisfied with life, and capable of handling it’s ups and downs. For example, this fall when I was not practicing yoga or meditation very regularly, I would frequently become anxious with an irrational fear of being fired for small infractions, despite repeated reassurance from my boss that I was doing a good job. I was very nervous about performance reviews, and became very stressed for a month in December/January when my progress reports were being sent back for edits. I remembered something my old principle told me much less gently than any of the messages I receive from my boss now, “you take things way too personally, Cheyenne.” Every time I think it my knee-jerk reaction is, “No I don’t!”, but when I really think about it it’s true. When my boss says, “Cheyenne, there were X and Y small mistakes on your progress reports, I’m going to need you to reread them, make corrections and send them back,” it doesn’t mean, “you’re headed for disciplinary action.” But that is what the judge in my mind things. I would worry and worry about something I said making it worse, or whether it meant that she was disappointed in me and might even cut my hours. As the observer more and more these days I can clearly see now that my fears were irrational, but that doesn’t erase the mental and physical toll they had on me at the time. Our ability to propel our attention into the future, or hold it in the past is uniquely and beautifully human, and it has conferred us with tremendous biological advantage throughout history. But so can it be disastrous for our mind and body. Our stress reaction is designed to help us react quickly and smartly if we’re in immediate danger – say for example we’re being attacked by a bear. Stress definitely helps us fight or escape the bear, but stress doesn’t help us in our worry about the past or future. And prolonged stress is a major contributor to just about every modern disease there is! So learning to let go of our stress as we walk through life also has a major biological advantage! How have I let go of the stress without removing the so-called source? Well I had to come to terms with how it made me feel, and switch off the judge in my mind while at the same time engaging the observer in my mind. Simply trying to ignore your problems instead of observing them doesn’t work either, your stress just manifests itself in self-medication and possibly even mental or physical illness down the road. So when we turn off the judge we have to engage the observer, watching our thoughts and emotions while trying not to get caught up in them. The good news is the more you practice, the better you get! And I’m not saying sit for an hour in silence! If you can sit for even 5-10 minutes a day it will surely improve your outlook and mood, and if you can’t simply try to “meditate-on-the-go,” by consciously breathing on your commute to and from work, when you get a moment’s break, or even in the shower! As an added bonus, my recent endeavors to practice meditation and mindfulness more regularly have increased my metacognition, my creativity, and perhaps even my ability to do sudoku! What benefits do you get from being mindful? Comment below! Last week I listened to a podcast called Seth Godin’s Startup School and I learned a lot about the difference between these two types of work. Author Gordin said, “Freelancers get paid when the work, they don’t get paid when they don’t.” And that really hit me. In the business of providing doula services and yoga classes I would be a freelancer. Also according to Godin, “Entrepreneurs build something bigger than themselves – they make money when they sleep.” My current model involves a lot of getting paid when I work, and very little getting paid when I don’t work. Perhaps this is the nature of my business, but perhaps I can be both. What really resonated with me is the idea that you can be both. Like Seth Godin, I would eventually like to spend 80% or less of my time as a freelancer, and 20% or more of my time as an entrepreneur. To do that I need to corner a market and provide something different or better than anyone else. What will people cross the street to get from me? I’ve been looking at my competition in the prenatal yoga, childbirth education, and doula fields and considering my options. Always on the back-burner is my idea to incorporate a space or community center for queer and trans nonprofits and organizations. I continue to let these ideas marinate, and perhaps someday soon my true path with unfold itself to me. As I continue to save financially to undertake my dreams, my next step is to really narrow down my goals and consider what I can realistically (and successfully) accomplish. My overarching goal this year is to get out of credit card debt and start saving! While I won’t reach my goal of having $600 saved for yoga teacher training by the end of March, I have significantly reduced my credit card debt by freelancing on the side of my regular job. As a tutor I make between $20-30 an hour, which helped me pay over $1,000 toward my credit cards this month. Through conscious thriftiness over 6 months we’ve paid off over $3,000 in debt. It’s been a long road, but when you have a concrete – AND AMAZING – goal in mind, it’s not so hard. If you’re considering getting out of debt or starting to save to start your own business, let me know in the comment below! Never in my life have I felt so simultaneously busy and at peace. I have chosen to put a lot onto my plate right now and I am managing it well. I have taken on 2 doula clients due in April and June, and I am awaiting the birth of my good friend’s baby in May. At Brightmont Academy we have had an influx of students and I have been working around 35 hours per week consistently. I also have 2 private tutoring student’s who are keeping me busy with 3-4 additional hours each week. Add to all that my monthly Mindful Queers and Allies Reading Circle (even though it does focus on meditation and mindfulness), planning a fundraiser for SPIRAL Collective, and hosting guests for 2 nights through AirBnB, and I’ve really had my hands full this month. Managing my calendar, my sanity, and my home life have required immense focus and vigilance on my part. Even though I tried to take care of myself by sleeping and eating well, I still ended up with mild cold symptoms by the end of week two. With a full weekend of rest I am feeling myself again today, and I have vowed to take it a little easier moving forward. My Midwestern American upbringing urges me to work hard and work long, so I can have trouble truly relaxing once it’s time. That’s where meditation comes in. Once you’ve completed your work for the day – and this isn’t defined by when your to-do list is complete necessarily, but by when you decide to call it quits for the day – try sitting in a quiet space and consciously reminding your mind to let go of your (busy, stressed, recurring) thoughts. Each time you are reminded of an idea, or something you should have done, simply try to let it go. If imagery is helpful to you, imagine this: each time you have a thought, place it on a cloud and watch it float away. You can also observe your breathing if this helps you direct your thoughts; think to yourself, “In, out, present, moment” with each in- and out-breath. As you watch your thoughts, try to watch them as a mere observer, not a judge. If your mind keeps returning to your work or your day, don’t get frustrated. Meditation isn’t the lack of thought, it’s this continual return to being the observer of your thoughts. So what have I accomplished in this busy month? Many things! I was asked to bring my famous Sausage Puff Pastry to Queer Vegan Thanksgiving, after my friend E.G. and her girlfriend Jenn were over for dinner at our place! 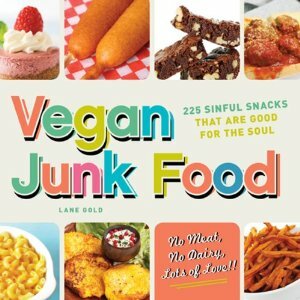 I wanted to impress them, so I picked one of my fanciest cookbooks: Vegan Junk Food! Everyone at dinner loved the sausage puff, which is simply veggie sausage, Vegenaise, herbs, and onions wrapped in a puff pastry roll! I was so happy when everyone asked for the recipe. Not only did our Thanksgiving centerpiece follow the Buddhist principle of “doing no harm”, but it was ad decadent and delicious as any Turkey I can remember from my childhood! If I’m going to enjoy the nostalgia of my childhood foods, the modern equivalent better damn well be delicious! At an Ugly Cookie Party in December! Once again my friend E.G. was gracious enough to host us for a food-related event. 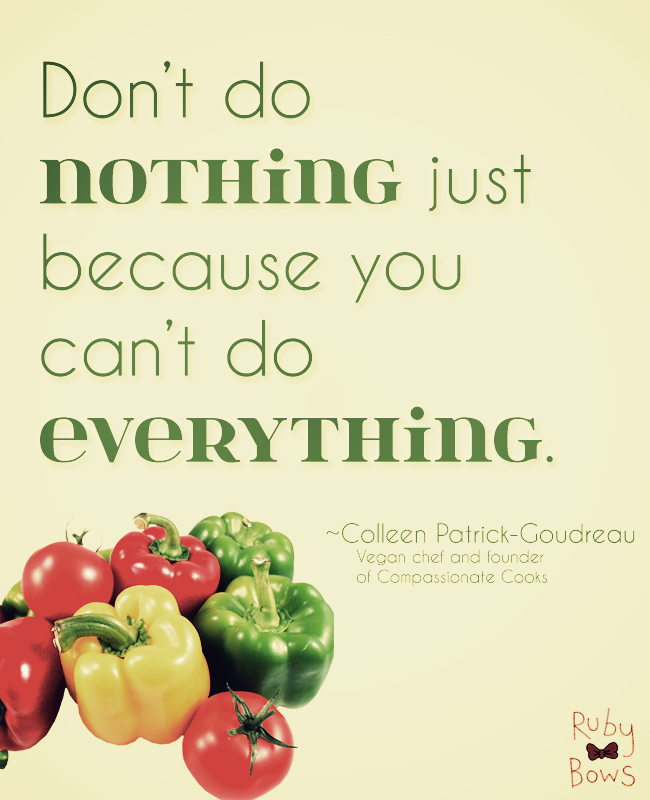 I am so #grateful to have such wonderful vegan cooks around me that love to share their home and recipes! So E.G. supplied the Ugly Cookie materials – everything from the cookies to the frosting and sprinkles. All we and her 12 closest other friends had to do was make the worlds nicest – or more likely ugliest – cookies in the world! It was a great opportunity to show my complete ineptitude at making frosted sugar cookies! And ugly or not, they were still Mmmmmmmm-rific! If you’re in the Twin Cities area and you’d like the invite, hit me up on Facebook! I hope you enjoyed my long-overdue somewhat-holiday update! In the hopes of owning my own business, I need to get out of debt and start saving! I’ve had more time than money lately so I’ve been looking for ways to bring in additional income on the side. This book caught my attention at the library yesterday and I decided to take it home. After flipping through it I found a myriad of potential profit-makers that have a “big upside and not much competition”. Basic secretarial and computer-related work from home can earn you $15 to $35. If you’re neat and organized you can start your own business de-cluttering garages, bedrooms, kitchens, closets, or home offices! You’d be surprised what vintage Levi’s go for on eBay these days. If you’re willing to do the research and scope out garage sales and thrift stores for deals then this could be a money-maker for you. Many used books can be turned for a profit on Amazon, depending on the title and quality. You can get started right away by selling a book online. Once you get some momentum and experience you can invest as little as $100 into selected books. And unlike physical bookstores it doesn’t matter how many books you have or what genres; if you have the title they want at a good price then they buy it. This idea may seem silly or super-gross to some, but I liked the idea of it for some reason. Many parents have been returning to cloth diapers in recent years, but they haven’t been returning to washing them. Now that cloth diaper services exist many parents prefer to have their dirty diapers picked up weekly, and it can even save them money over disposable diapers. If you’ve worked in schools previously (or currently) the idea of being a tutor may have occurred to you. As a teacher and tutor myself I can guarantee that the most money is to be made in starting your own business. Tutoring companies are great for gaining experience, but they charge the families upwards of $50-75 per hour and give you $15 or $20 if you’re lucky. Why not go into business with families directly and undercut those larger organizations? The only downside is that while you’re building your name and customer base, you may run into difficulties with families who just want to go with a company they trust. Thankfully not everyone is satisfied with those “big-box” tutoring groups and there’s still space for independent tutors. Pet services gets my number 1 because of the ease of access and the extremely low startup costs. The book actually breaks different pet services up, but I’ve rolled them together into my new temporary business. You’re looking at Minneapolis’ newest doggy poop scooper! I’ll be offering yard cleaning services, litter box cleaning, dog walking, pet sitting, and light grooming. You can do this too! All you need is a love for animals and a lack of squeamishness! Here’s another great resource that lists 10 businesses you can start for less than $100! So far over the past 6 months I have cut our debt in half and gotten current on my student loans through focused effort and planning. That may be what others would call “progress,” but as always, rebuilding your finances takes longer than you like. Celebrating your accomplishments can be hard when you’re not yet arrived at your ultimate goal. It’s hard specifically not to get caught up with wanting things to be different than they are now, or wanting more money, or wishing you could make things happen right away. That’s living in the future, which won’t help us gain anything except a vague yet persistent dissatisfaction. I’ve been trying to counteract my impatience to reach my goals by employing mindfulness techniques. When I remind myself that happiness is always accessible to me in the present moment, I can find things to be grateful for right now. Here are some tips for finding happiness in the present moment! So who’s been to Marla’s Caribbean Cuisine in South Minneapolis? This little corner restaurant is been in the neighborhood since 2005, but I only discovered it this year, and boy do I wish I would have found this gem sooner! The owner Marla – who can be seen flitting around the restaurant nightly – puts out cooked-to-order Jamaican-Indian fusion dishes that will known your socks off! A few weeks ago Remy and I took my mom and grandma out for dinner at Marla’s and we all had a wonderful time. Then a few days later we had to go again with our good friends Laura and Sarah! If you check it out be sure to try the “Da-Bulls” appetizer… it’s impossible to explain, but completely melt-in-your-mouth delicious! Check out the accolades they’ve racked up! Keep in mind that the jerk and the curry at Marla’s are smokin’ hot, so if you prefer your food with a Scandinavian (lack of) spice level then order yours extra mild! Turn your car into a mobile classroom, a university on wheels. Completely my anchor habit for 20 minutes. I meditated on the qualities I need to become, repeating them 3 times each. Did back bending poses from Om Yoga. Held bridge pose, and bridge pose with one leg up both for 10 breaths. Finally held my headstand for a full 10 breaths! Today’s action: Identify some passive time in your daily routine that you can put to better use, be it by meditating, being mindful, focusing on gratitude or solving problems, or listening to something educational or uplifting. Then get set up, whatever that entails: downloading podcasts to your iPod, learning a meditation routine, etc., so that beginning today or tomorrow, you can start putting that passive-mind time to good use. I already spend my time meditating during my drives to and from work! I shouldn’t be too proud, it’s not like I do it every day. But I recently mentioned to my partner Remy that I would like to focus more on meditating while driving. I said, “I feel like I spend more time being mindful than I do driving mindlessly on my way to work, but on my drive home I spend more time distracted by far. Isn’t that interesting? I’ve been trying to be more focussed and sustained in my meditation during my drives, because I feel like I do have some mental energy to expend. When do you have “autopilot” time that you could be using in a focused way? I’ve also been listening to books on tape since October, including The People’s History of the United States, which I’ve really been enjoying. It’s a history from the people’s perspective, the subjugated and oppressed rather than the conquerors. The story is inspiring, sad, empowering, and uplifting. Back to Wake Up – 31 days to take charge of your life, I really like Matt Frazier’s encouragement to balance productivity and down-time. He says, “Again, I’m not overlooking the necessity to “just be” sometimes…” which is important to remember. He isn’t encouraging us to spend every single moment being productive, he is encouraging us to be mindful of how we spend our time – be it meditating, or listening to an audiobook or music. Most people need more “just be” time, and I really respect a plan that encourages time to just be with yourself. Completed my anchor habit for about 20 minutes with Remy. Led a great sitting meditation, then warm-up, then sitting poses from Om Yoga. Felt great to do it together… But then afterwards Remy told me honestly that he doesn’t like it when I ask him to do yoga the night before – it makes him feel obligated and cranky about it in the morning. He shared that he’d prefer if I simply told him in the morning, “I’m going to do my practice and you’re welcome to join me if you like.” I guess I can understand not wanting to do yoga out of requirement. I would always prefer to do yoga when I feel it’s my choice rather than something I have to do. I want him to feel good about yoga so I’m going to try to take this approach moving forward. We can all learn something from my interaction with my partner this morning. We can make people feel negative thoughts or positive thoughts simply by demanding or leaving the opportunity open. Small differences in tone, demeanor, and word choice can make all the difference. When do you guilt someone you love into something because you don’t think they will do it unless they feel obliged to you? Do what it takes to keep your motivation strong. You’re over halfway through this program, but there are still a lot of actions to complete and changes to make. Catch up, get organized, review what you’ve done so far, and give yourself a dose of inspiration or an external reward. Today I reviewed my notes and journals, and updated my business journal. I feel good about my progress, and I hope to do my weekly review this Sunday! I also took a nice shower and prepared for tomorrow by packing and organizing my work bag! Feelin’ great. Learn how to separate the majors and the minors. A lot of people don’t do well simply because they major in minor things. Completed my anchor habit for 37 minutes. Meditated on the qualities I need to become – see Day 11 – for 5 minutes, then started my yoga. Decided to do a strength routine today, which included 3 sun salutations, the balancing poses (for Wednesday), boat post, some inversions, and twists. Boat pose is especially challenging for me. Most poses I tried to hold for 5 or 10 breaths, which added another layer of strength to the routine. Warm-up and sun salutes each took 5 minutes, and the rest of the routine lasted 22 minutes. Did headstand instead of forearm stand and fell out of it the wrong way. Hurt my fingers. Made myself get back up and come down the right way before moving on. Was kinda scared I would hurt my fingers again. Did it anyway. Felt good. The idea, then, is that you can drastically reduce the amount of stress in your life and time you spend on work, fitness, and just about anything else by focusing only on the 20 percent of activities that produce 80 percent of your results. After feeling bad for a few days for not really doing the above journal, I ultimately decided to forgive myself for not doing it. It’s okay if every single topic in this book doesn’t resonate with me, and I am proud of myself for writing what I felt. Sometimes we just have to offer ourselves kindness and not force things that don’t feel productive or joyful. Completed my anchor habit for 15 minutes. Did Standing Poses from Om Yoga. 2 minutes meditation, 10 minutes yoga, 3 minutes savasana meditation. Savasana meditation after yoga has been feeling so good lately. Do you end your personal yoga or yoga class with a savasana meditation? It’s wonderful. You can practice this pose in bed at night to help you get to sleep too. You simply lie down on your back with your palms facing up, letting your feet fall apart, and you can focus on your breathing, or you can focus your attention on each part of your body slowly from your feet to your head. It can be very relaxing, but it is also a very challenging pose. Savasana, or corpse pose, is practice for death. It is very easy for them in to wonder during corpse pose. It may wander to an earlier time in your day and relive a conversation or jump forward to things you need to accomplish. Then come the worry that you might have said something wrong, or your might forget that thing you need to get done. Sitting with that discomfort is where the real magic takes place. After a while you will have a thought that you enjoy, or perhaps dislike, and you won’t want to stop having it for whatever reason. This is were the rubber really meets the road: once you realize your mind has wandered, bring it back to your breathing, or your body, and come back to savasana. If I gave up my iPad time (except for Wake Up), and limited my chatting and TV time to 30 minutes per day I could save 5 hours per day, which is 35 hours per week, 140 hours per month, and 1680 hours per year. That’s a whole 70 days of my year. I could really use 70 days to commit to my business, finances, and future. And I bet you could too! Who doesn’t need 70 days? My goal is that by the end of the January 2015 I will limit my TV watching and smoking time to 30 minutes per day, and I will not use the iPad except to do Wake Up and whatever else I choose to do intentionally for 1 hour each day. Learn #15 things: I was right all along! Woohoo! Today I didn’t learn anything except that I was right all along about… Bathrooms! Yep that’s right… This may seem totally off on a tangent but bear with me hear and you too could learn something today! With any luck you’ll have been right all along too! So I was just watching Mythbusters and this new episode in season 14 really caught my interest! Down and Dirty/Earthquake Survival (Season 14 – Episode 3) was full of bathroom myths, and the one that caught my attention was related to the most used and dirtiest bathroom stalls in public restrooms. The myth postulates that because people think the first stall closest to the door is the dirtiest, they avoid it, or because of privacy reasons people will be more likely to choose the stall furthest from the door. They tested their hypothesis at a public restroom using ingenious door counters on the stalls. They tested for “dirtiness” by thoroughly cleaning the bathroom beforehand and then hilariously swabbing the toilets afterward. The results of the Mythbusters study was that not only was the first stall closest to the door the least used, but it was by far the cleanest. The 2nd stall was the most used and the second dirtiest, the third was the next most used and the dirtiest, and the last one was the second least used and second cleanest. So to sum it up for you, your best bet is using stall number 1 (closest to the door) or stall number 4 (or the last stall) in a 4-stall restroom! Probably don’t use the second stall!